I'd never actually had stuffed bell peppers before but with the super sweet and flavorful CSA bellpeppers we were getting, it made sense to make them the star on the dish instead of just a supporting actor. When we received several small bellpeppers, as well as one large one, in this week's share, we seized the opportunity. We used this recipe as a base and used what we had on hand. SLICE corn off the cob, use the dull side of the knife to pull off the remaining kernels and "milk"
1. 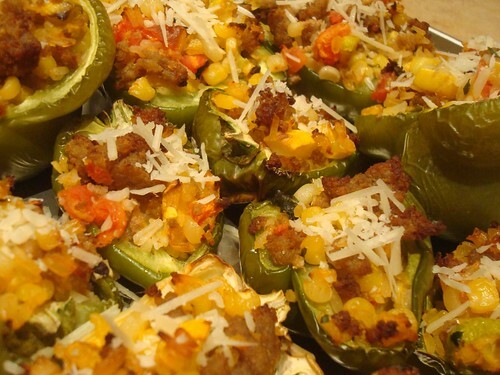 This is a fairly non-traditional stuffed pepper recipe (most seem to be meatloaf in a pepper). It was delicious, light, summery, and faintly sweet (from the corn and the squash). The Parmesan was a wonderful addition, providing a nice balance to the meat and veggies. 2. The lack of sauce meant that the ingredients were likely to tumble out as you were trying to eat it. A very light sauce might solve this problem and accent the dish nicely--perhaps something cheese based? 3. We ended up with far too much filling for our peppers, so if you want to only make ~4-5 peppers worth, you might cut this in half or two thirds.